Hands down our favorite town in Cinque Terre. Vernazza is nice, but touristy and not as pretty. Make a day trip there by train instead. Manarola, a proper village with very few cars (most are not permitted beyond the parking lot above town), a central church complete with bell tower that tolls on the hour, pastel patchwork buildings, flanked by terraced vineyards and open to the crashing sea. And the almond biscotti in the only market in town is world class. We love this town. Tiziana owns the Airbnb apartment we rented in Manarola. She greeted us at the church square and gave us the warmest welcome in her mix of English and Italian. Her son studied in NYC and had been the one behind the exceptional directions and day trip recommendations I’d received before arriving. 🙂 Her family owns the vineyard on the hill and makes a small production of wine from it. She was so genuine in her desire for us to enjoy her apartment that she makes the top 5. Hiking town to town. 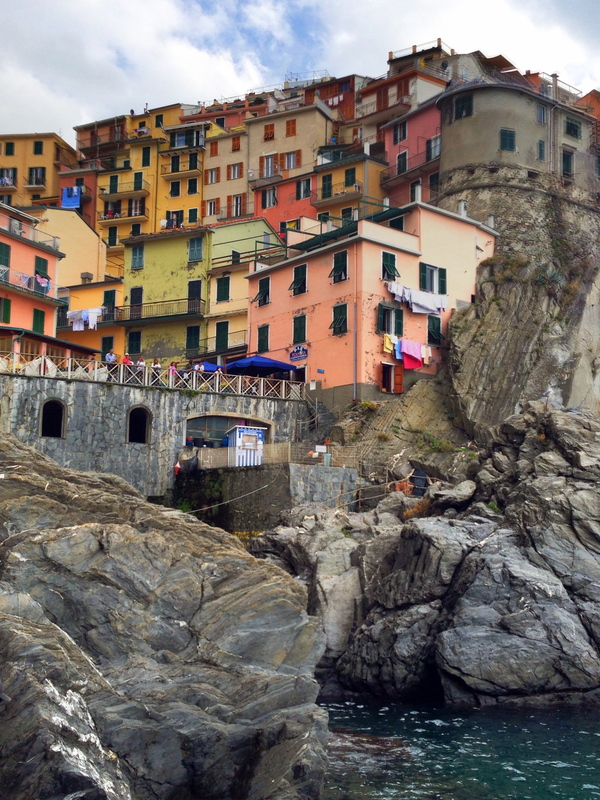 It’s why you come here, although just spending time in Manarola would be worth it. We took the train from Manarola to Levanto, hiked to Monterosso and intended to hike all the way to Corniglia via Vernazza but a storm was brewing and they closed down the path. molto pericoloso. So instead, we shopped. Got a long sleeve T in Levanto at the street market for 5€. If it were in a JCrew catalog it would be called “Weekender long sleeve boat neck T. Jersey. In Merlot”, it doubles as long underwear. Followed by a soft-as-cashmere, sand colored sweater with signature Italian gold studs up the sleeves (they love their bling!) in Monterroso, again at the street market. This was right after another vendor, a 70+yr old man, threw a temper tantrum that rivaled any 2 yr old, when I didn’t purchase the shirt I tried on. We walked away, laughing cause it was Oscar worthy, as he threw the item on the dirty street and stomped on it cursing us in Italian. Wish I’d had my Google translate app in action to know what could possibly be that upsetting. We enjoyed speculating over an espresso shortly after. Some people’s grandparents! And lastly, a new dress in Vernazza. Doubled my wardrobe in one day! View from our room in Manarola. Here’s Rick Steven’s account. What struck us as we hiked through the gnarled forests and saw the rock hard natural earth, was the sheer grit, determination, and back breaking work it must have taken generations of farmers to cultivate this land. Not to mention the train they built! An engineering feat. And the risk of mudslide that tragically hit Vernazza in 2011. Mindblowing. Right down the way from Tiziana’s apartment, the best meal we’ve had in our 2 months of travel was at Trattoria Dal Billy. We shared a melt-in-your-mouth tuna and hamachi sashimi appetizer, followed by a 2 person portion of homemade tagliatelle with fresh tomato, crab and lobster. They offered us bibs which we should have accepted. Stained by brand new sweater but…MOUTH WATERING DELICIOUS. We didn’t speak for the first 10 bites. Eyes closed, savoring. For dessert we had a bomb-diggity chocolate torte accompanied by their signature placement of three bottles on your table to drink from. Grappa, some blueberry liquor and my fav, Limoncello. I believe their generous gesture was meant for us to sample these, not have 10 shots each…but we befriended a likeminded Scottish couple at the neighboring table and shut the place down. It was about 6 shots deep when I decided it was a great idea to let the waiters know a friend of mine who shall not be named, had slept with one of the staff at this restaurant on her visit several (I didn’t date myself by saying how many) years back. And would they please pose for a photo so she could identify if it was one of them. Suddenly fingers pointed and they all claimed innocence having only worked one or two seasons. Turns out it was the owner’s son. We stumbled home, Scottish couple in tow, to polish off the bottle of white we bought at Volpaia during our 7 gluttonous days in Tuscany. Pissed all of the neighbors off smoking on the terrace and talking loudly about politics. One of my favorite nights of the Cinque Terre trip so far. We’ve kept in touch and know we’ll have another such night with Carolyn and Stuart some day. It may involve some bagpipes. OMG..your blogs are Oscar worthy! So well written and fun to read!! Ms.Stitham would be proud of you!! I’m sorry I do not, you can try contacting her through Airbnb’s message feature though! Good luck!